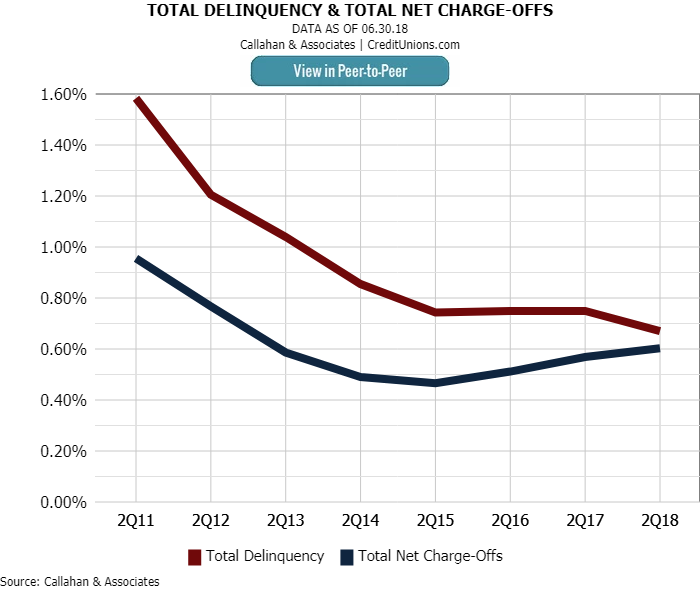 Total delinquency at credit unions was lower at midyear 2018 than it was one year ago. Based on early performance data derived from 5300 filings, Callahan & Associates predicts total delinquency dropped 8 basis points to 0.67% as of June 30, 2018. Although that is 1 basis point higher than the first quarter, delinquency rates this year continue to be the lowest since the Great Recession. In fact, the second quarter rate of 0.67% is a full 1.1 percentage point lower than the high recorded at year-end 2009. The net charge-off rate increased 2 basis points year-over-year to 0.59%. Charge-offs for credit cards was up 32 basis points annually to 2.87%. This is the fourth consecutive year that charge-offs for credit cards has increased, and this quarter’s rate is the highest since year-end 2011. Historically, higher charge-offs in credit cards has led to higher charge-offs in consumer loans compared to mortgages. This quarter is no exception. Total delinquency was up 1 basis point over first quarter; however, delinquency for the year is still the lowest in the post-recession era. Delinquency for credit cards also was up at midyear. The only loan product to record such an increase, credit card delinquency was up 7 basis points to 1.15%. Credit card delinquency has been on the rise for the past four years, but the speed appears to be slowing. 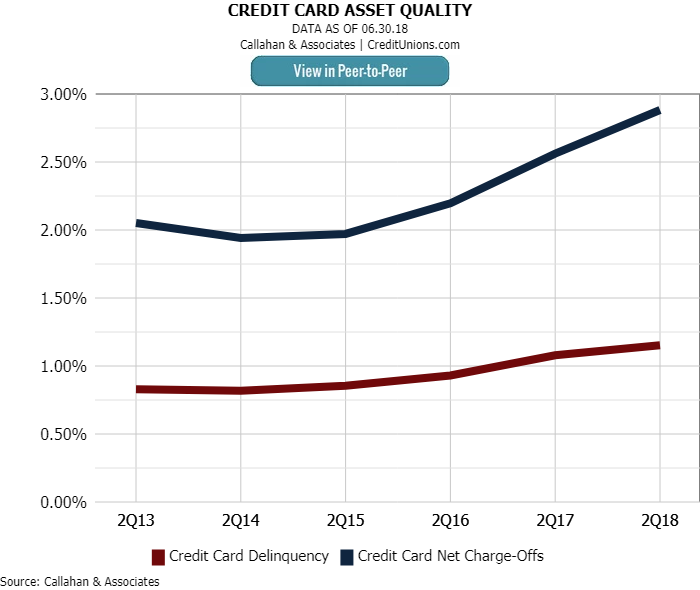 Credit card delinquency increased 7 basis points year-over-year compared to 15 basis points from second quarter 2016 to second quarter 2017. At 2.87%, net charge-offs for credit cards was the highest it’s been since year-end 2011. In addition to credit cards, auto loans are the other major component of consumer lending. Credit unions reported a drop in delinquency of 4 basis points, to 0.55%, in auto loans. Delinquency for new and used auto loans both dropped — 2 basis points to 0.36% and 5 basis points to 0.67%, respectively. New auto loans had the lowest delinquency of any credit union loan product. Like delinquency, charge-offs for auto loans were also down. Charge-offs were down 1 basis point to 0.44% for new auto loans and down 5 basis points to 0.75% for used auto loans. 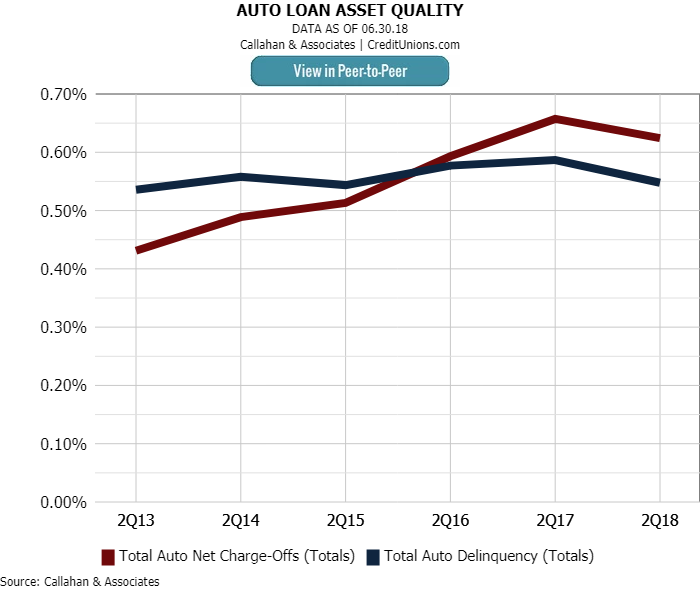 New auto loans had the lowest delinquency of any product, 0.35%, in the second quarter of 2018. First mortgage delinquency continued its post-recession decline. Since 2011, first mortgage delinquency has dropped 1.7 percentage points to 0.52% as of June 30, 2018. Real estate lending comprised the majority of the loan portfolio with first mortgages accounting for 41.0% of the industry’s loan portfolio as of June 30. At 0.48%, other real estate delinquency improved 7 basis points since second quarter 2017. 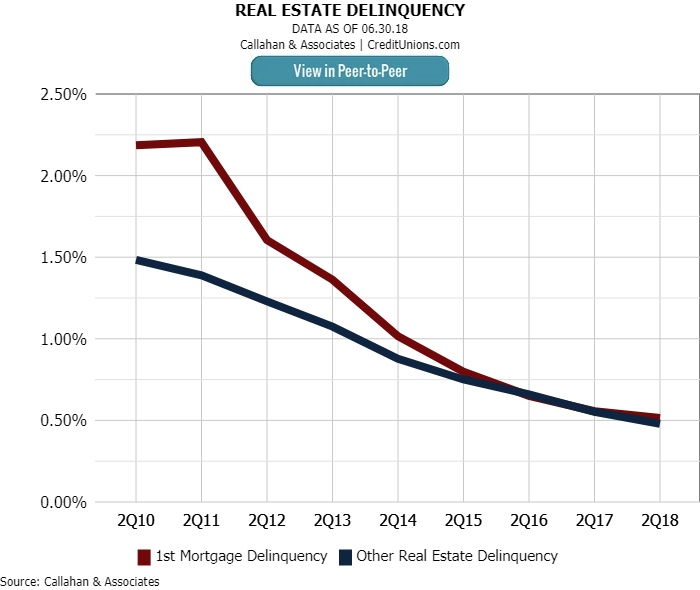 First mortgage delinquency has dropped 1.7 percentage points since second quarter 2011.